Rebekah Price worked as the Information Officer for Samaritan’s Purse after Cyclone Pam hit Vanuatu in mid-March. After about two hours of clinging to the rails in a truck along a dusty, bumpy, and, at times, almost completely washed out road, we arrived in a remote area in the northern part of the island on Tanna in Vanuatu. The mobile medical team unloaded and began dividing supplies among ourselves in preparation for the walk to the village where we were headed with medical care for those affected by Cyclone Pam. The only way to reach the community was to leave the road and walk. As we headed down the path, it became quickly evident that this wasn’t just a walk; it was a hike. A valley stood in between the village and us. With careful steps, we navigated down the cliff, sometimes sliding on loose dirt and always looking for roots or rocks to make the descent a bit less precarious. With a heavy bag of supplies, the team took turns hauling it, as there was also a mountain to climb to reach the hilltop community. To reach the remote community of Hebron in North Tanna, our medical team carried their equipment and supplies along this footpath leading straight up the hill from the coast below. This trail is the only way to reach Hebron. Upon reaching Hebron, catching our breath, and drinking quite a lot of water, the team set up to receive patients in the church building. Though damaged, it provided a good place for everyone to gather. From the children to the elders of the community, our doctors and nurses examined, treated, and prayed for those who came seeking medical care. Once the clinic was finished in Hebron, we learned that another community even further out was also coming to see the medical team. With another scheduled clinic waiting for our arrival, we decided to split up. For half of us, it was time to head back down the hill and hike up the other side. As we reached the base of the hill, we met a man along the road. He began talking to Stephen, who was helping translate for our team. I don’t know the local language, but I could tell that Stephen was explaining that we had been holding a medical clinic in Hebron. We continued on, and the man hiked with us, even helping to carry some of the medical supplies. When we reached the top, Stephen explained the man’s name was Bob and his family lived nearby. Bob’s daughter had recently become very sick, and he asked if our medical team could visit her. He was unable to carry her to the clinic. Along the path back to the truck from Hebron, our team met a man whose daughter was sick and unable to travel to the site where the clinic was held. One of our doctors, nurses, and translators went with Bob to his home where they were able to check on his daughter Jill and give instructions and medicines for care. 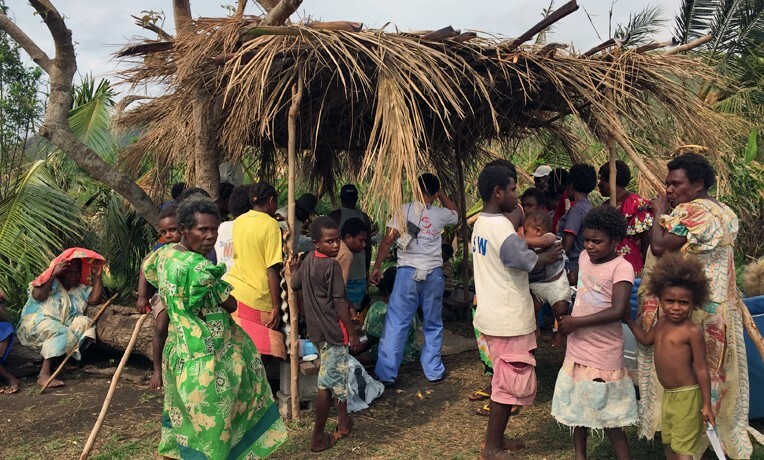 Like many in North Tanna, this family had lost its home to Cyclone Pam. Bob and his wife Miriam were thankful for the visit from our medical team. It was a well-timed visit as Jill was in great need of medical attention. We followed Bob to his home. His daughter Jill lay under a makeshift shelter made of local wood covered with a thatched roof. As I looked around, I could see that the storm had done significant damage in the area. While the team examined Jill, I spoke with her mother, Miriam. She pointed at another similar structure and explained that it was their house. Their home was completely destroyed during the storm, and they were rebuilding from materials that they could salvage or find. Bob and Miriam’s care and concern for Jill were evident as the team worked. Miriam said that with no evident cause, Jill had begun to be sick and in pain. This family lives simply, growing what they need in their gardens or trading in their village. They live a boat ride or a day’s walk from the closest hospital. As I stood there and watched the medical team at work, it reminded me of Jesus’ work. There were many times when He encountered people along the road in need of healing and in search of help and hope. I thought of the story of Jairus in Luke and how he pleaded for Jesus to come and heal his daughter. A Samaritan’s Purse doctor treats patients in Hebron. In this case, Jesus was using a team of medical professionals who were willing to say yes to His call to walk into a devastated area to bring healing and hope. The timing of encountering Bob along the road was critical. Jill was in desperate need of care, care that we were equipped to deliver. We were able to give her medicine and instructions for treatment. The team traveled on to another community. In all, our medical team saw more than 75 patients that day, but Bob and Jill stood out in my mind. God knew the need in this family. Meeting Bob along the road was a beautiful picture of how God cares for each person. Just as Jesus took the time to care for Jairus’ daughter and bring healing to her, we met Bob at the right time to be able to deliver care and encourage his family that they are seen and loved. God knows our needs, and He cares for us. Sometimes that means holding onto faith while waiting and praying, and sometimes that means bringing a team from three different countries right into your home in your time of need.